Multivitamins are the most important of the basic or foundational supplements providing nutrients essential for health and wellness. Because if there is a single nutritional supplement everyone should take, a multivitamin is it. But it can’t be just any multivitamin. The best multivitamins are complete, high-potency, high-quality, high-purity, provide a complete range of essential vitamins and minerals, and contain advanced forms—more about advanced forms later. The purpose of taking a high-potency multivitamin not only is to provide the body with amounts and forms of nutrients meeting minimum requirements for avoiding deficiency conditions, but also sufficient levels of nutrients that can support optimal health. Because vitamins levels for optimal health are NOT the same as levels required to avoid deficiency conditions. While 40% of Americans say they take a multivitamin daily, how many actually obtain all the nutrients they need for optimal health from taking it? Practically no one. Why? Because basic “recommended daily amounts” (100% of daily allowance) typically found in multivitamins are based on models for disease prevention. That is, these are minimum levels indicated to avoid conditions like Pellagra (caused by vitamin B3 deficiency), Beriberi (caused by vitamin B1 deficiency), or Rickets (caused by vitamin D deficiency), for example. Nutrient fortification of foods by law has mostly eradicated those conditions. But, as noted, minimum recommended amounts are not the amounts required for optimal health. The best multivitamin supplements therefore do not provide just 100% of a recommended daily amount of a certain nutrient, but far higher amounts. That is for truly optimal health, high-potency is a must in multivitamins. One of the main reasons for this is “biochemical individuality.” While most people fall within a certain range in terms of their needs for a specific nutrient, the overall range (or bell curve) may be quite large. Your needs may be greater. Another, related reason is genetics. If you are heterozygous for a gene that requires a specific nutrient, then you may already be at a disadvantage for assimilating or processing it. If you are homozygous, then not having sufficient amounts of a nutrient can have much larger, adverse consequences. For any given nutrient, then, your needs may be higher or significantly higher than other people’s needs. The best way to guarantee your needs are met is to ensure you consume larger amounts. That is, a high-potency multivitamin providing levels of nutrients well above the minimum amounts established to avoid deficiency. High-potency multivitamins work well because vitamins—at least at the levels we are talking about here—are non-toxic, safe, and well-tolerated. Add to the safety of vitamins their relatively low cost (especially compared to pharmaceuticals) that solidifies the case for high-potency multivitamins as a virtual “no-brainer” for supporting good health. That is the basic rationale for why you need a high-quality, high-potency multivitamin. There are many other reasons. Such reasons include the fact that diet alone is usually not enough to provide the levels of basic nutrients you need. Diet alone could perhaps be sufficient if foods were nutrient-dense and you consumed enough of them. But foods today are typically not nutrient-dense given how modern agriculture has stripped the soils of essential nutrients. Herbicides and pesticides then poison foods. And the widely used glyphosate herbicide (RoundUp) actually depletes nutrients in foods by blocking their uptake in plants leading to further depletion in crop foods. Food processing then strips out additional nutrients. Get the picture? On top of all this, your requirements for nutrients are increased by factors such as pollution and chemical exposures (and greater stress on detoxification organs), emotional stress, immune stresses (like fighting off colds or flu), and even free-radical stress caused by electromagnetic fields (EMFs) such as mobile phone and Wi-Fi exposures. In many cases, various stresses and environmental exposures put a greater burden on your antioxidant defense systems by subjecting you to free-radical attack. This is just the beginning. Assuming your diet were “perfect” (which most likely it is not), your needs for various nutrients will vary depending on your levels of exposure to stresses (emotional, chemical, electromagnetic, etc.). This means that as your needs for extra nutrients rise to combat these stresses, the simplest and best way to meet those needs is through consuming additional, supplemental amounts of nutrients—to successfully meet those needs. Otherwise, having only minimal amounts (i.e., daily values created to avoid deficiency diseases) means your need for higher amounts will not be met. A multivitamin can meet those additional needs, or at least start meeting them. In fact, a multivitamin is the best “first line of defense.” In the HPDI system, a multivitamin is just one of six foundational supplements—but it “first among equals” and therefore the very first supplement we recommend. This means that if you do nothing else, then take a multivitamin. Need another good reason to make a multivitamin? Again, genetics. HPDI has teamed up with Bodysync, the developer of Nutrisync genetic tests (available to HPDI resellers on the reseller website and to retail customers by phone) that offers testing for health-related genetic variations in your DNA. Among the first things we realized after analyzing Nutrsync genetic test results is that many genetic variants that may cause problems with uptake of certain nutrients—or that require additional amounts of nutrients—can be partly or wholly mitigated by taking a high-potency multivitamin. This is not true in every case, but surprisingly the nutrients provided in a quality multivitamin can be a strong defense in this regard. Another thing we noticed is that the results of almost everyone taking the Nutrisync test exhibit certain genetic weaknesses that would benefit from a multivitamin. Another “no brainer” observation that may not have been so obvious beforehand, yet which corresponds with what we have been recommending to clients for decades: Take a multivitamin! People may not realize that optimal health is within reach. Taking a high-potency multivitamin daily is a major first step toward achieving it. • Protects against nutrient depletion caused by increased needs for nutrients (e.g., various stresses or periods of inadequate intake). HPDI formulates and sells some of the highest-quality, high-potency multivitamins available. Many of our customers are health professionals who supply their clients with our multivitamins—because health professionals demand supplements proven to be effective. And they know the difference! • Multi Two and Mighty Multi-Vite! are flagship multivitamins with advanced forms. Multi Two offers higher levels of B vitamins, whereas Mighty Multi-Vite! provides relatively more antioxidants and phytonutrients. • Mini Multi is formulated for chemically and environmentally sensitive individuals or those who seek ultra-high purity. Mini Multi contains no excipients (i.e., additives or fillers), and provides 100% coenzyme vitamins. 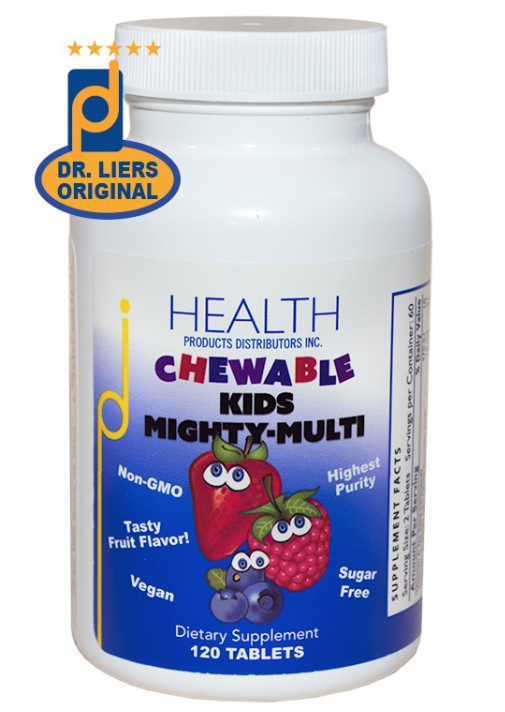 • Chewable Kids Mighty-Multi! tastes great and includes xylitol to prevent cavities. Kids love this chewable formula, but it is also scalable for adults. This formula is most similar to Mighty Multi-Vite! in terms its nutrient content. HPDI multivitamins: Multi Two (caps and tabs), Mighty Multi-Vite!, Mini Multi, and Chewable Kids Mighty-Multi. 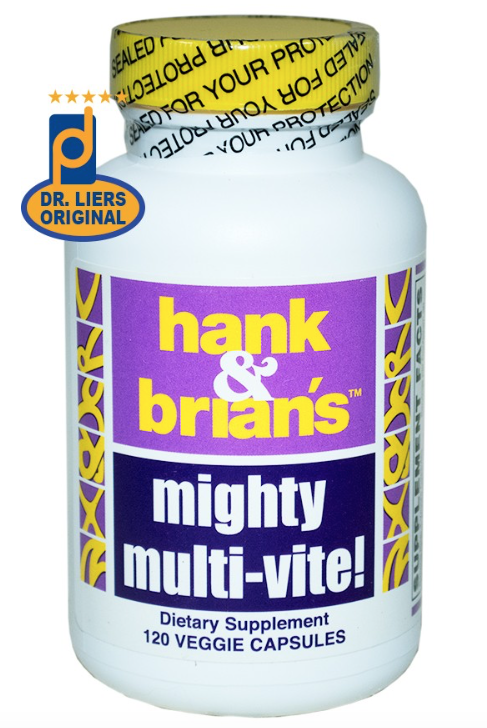 HANK & BRIAN’S™ MIGHTY MULTI-VITE! (or as we often call it, the “Mighty Multi”) is perhaps the premier HPDI multivitamin, and definitely among the flagship multivitamins we offer. I personally take this one most of the time. It is in the “Hank & Brian’s” line, which generally are among our best products. Mighty Multi incorporates the latest nutritional research in a complete formula that combines the highest-quality, most assimilable forms of vitamins and minerals along with advanced herbal nutrition. Mighty Multi-Vite! 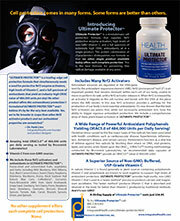 is an advanced, cutting-edge multivitamin that is a leader within HPDI’s line of foundational supplements. This formula exhibits superior performance with respect to supporting optimal health, and is among the world’s most sophisticated multivitamins. Mighty Multi-Vite! works synergistically with other foundational supplements to help sustain maximum health, vitality, and promote longevity. Mighty Multi-Vite! is an HPDI flagship multivitamin offering special nutrients for antioxidant protection. COMPLETE, BALANCED ESSENTIAL NUTRITION – Provides a full spectrum of nutrients exceptionally well balanced for creating and maintaining optimal health. Mighty Multi-Vite! offers all the most important vitamins along with minerals, cofactors, antioxidants, and herbs. RAPID, EASY ASSIMILATION – Incorporates the most bioavailable vitamin and mineral carriers most easily recognized and rapidly assimilated by your body. In addition, the formula uses multiple forms of mineral carriers to ensure assimilation. In addition, the capsule form speeds uptake because it does not require time for the body to break it down (unlike tablets). ENERGIZING – Includes coenzyme form vitamins and Krebs Cycle bionutrients that work with your body to create super high energy levels. Provides significant levels of B vitamins (especially coenzyme B vitamins) known for boosting energy, supporting the body during times of stress, nerve function, heart function, and for working together with dietary RNA (found in Rejuvenate!™ superfoods) to produce significant therapeutic effects. FOUNDATIONAL SUPPLEMENT – For creating health and establishing a complete supplement program. Providing excellent foundational nutrition, Mighty Multi-Vite! is designed to work synergistically with other foundational formulas for maximum health benefits. A full spectrum of B-complex vitamins, most in coenzyme forms, as well as more conventional forms. Includes Vitamin B1 as thiamin HCl and thiamin diphosphate, Vitamin B2 as riboflavin and riboflavin-5′-phosphate, Vitamin B3 as niacinamide and niacin, Vitamin B5 as pantothenic acid, Vitamin B6 as pyridoxine HCl and pyridoxal-5′-phosphate, folate as L-5-methyltetrahydrofolate (L-5-MTHF), Vitamin B12 as methylcobalamin, and biotin. All of the most absorbable and usable forms of the fat-soluble vitamin group, including Vitamin A (as beta-carotene), Vitamin E (as d-alpha tocopherol succinate), Vitamin D-3 (as cholecalciferol), Vitamin K (as phytonadione and MK-7). A complete and balanced supply of the most abundant carotenoids found in the body, including beta- and alpha-carotene, as well as lycopene and lutein. A variety of the best-known herbal preparations, including quercetin, grape extract, turmeric (95% curcuminoids), broccoli sprouts powder, octacosanol from policosanol, and stevia. All of the known essential minerals in forms readily absorbed and recognized by the body including calcium, magnesium, potassium, zinc, manganese, boron, copper, chromium, molybdenum, vanadium, and selenium. Mineral carriers such as ascorbates, Krebs cycle bionutrients and amino acids providing the body with important metabolic substrates and vitamins, including citrate, succinate, alpha-ketoglutarate, fumarate, malate, glycinate, aspartate, sebacate, and Vitamin C.
Includes the important sulfur-containing amino acid N-Acetyl-L-Cysteine to support the body’s antioxidant and detoxification systems and betaine HCl to support digestive processes. Includes choline and inositol which play a crucial role in all of the cell membranes of the body, in brain function, and in liver function. Exclusion of the prooxidant minerals of iron and iodine which can lead to excessive free-radical production and PABA that sometimes adversely affects brain function in some individuals. Note: we sell iodine as separate formulas. Capsule form that ensures the maximum absorption of ingredients. Four-per-day full dosage that allows for partial dosing for children, seniors, and pets. Vegetarian formula – including capsule. Capsule contents designed to smell and taste good to adults and children when emptied into smoothies, drinks, and foods. This allows greater flexibility of use. Exclusion of ingredients such as wheat, gluten, dairy, corn, soy, and egg having well-known antigenic properties and that may be associated with allergy or delayed hypersensitivity reactions. A minimum of excipients, fillers, lubricants, etc. having deleterious effects in some individuals. No GMOs. As I mentioned previously, the Mighty Multi is uniquely advanced it that it provides special antioxidant ingredients like turmeric, grape extract, and broccoli sprouts powder. 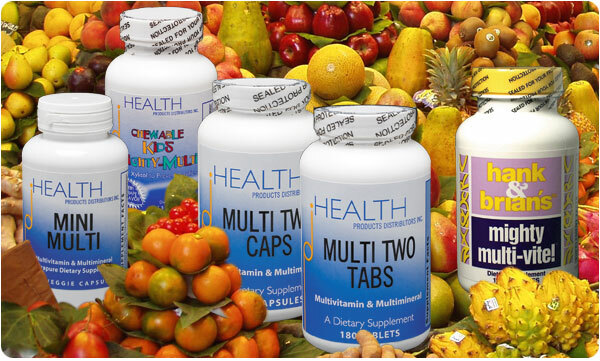 MULTI TWO is another HPDI flagship multivitamin. We recommend it especially for individuals who prefer more B vitamins built into their multivitamin. Yet, it offers somewhat fewer antioxidant nutrients. MULTI TWO is a pure, complete, biochemically formulated multivitamin supplement with minerals and cofactors. It dissolves readily and is highly bioavailable. All ingredients are sourced for purity and carefully selected to avoid common food allergens. MULTI TWO is available in tablet and vegetarian capsule forms. MULTI TWO is among HPDI’s most popular multivitamins, providing top-notch quality, high-purity, advanced design and formulation, and exceptional value for the price. The formula comes in tablet or capsule forms. The tablet is suitable for vegetarians, only containing plant fiber to bind components, further eliminating chemical contaminants. The capsule form now is also vegetarian. The capsules have a four-per-day full dosage allowing for partial dosing for children, seniors, and pets. Note: the capsule’s powder contents taste quite good to most people, so it can be added to sippy cups, blender drinks, smoothies, pet foods, etc. MULTI TWO is one of HPDI’s foundational multivitamin supplements in our health recovery and maintenance programs. A foundational program of supplements includes a multivitamin, essential fatty acids, a Vitamin C formula, and a Rejuvenate!™ superfood. 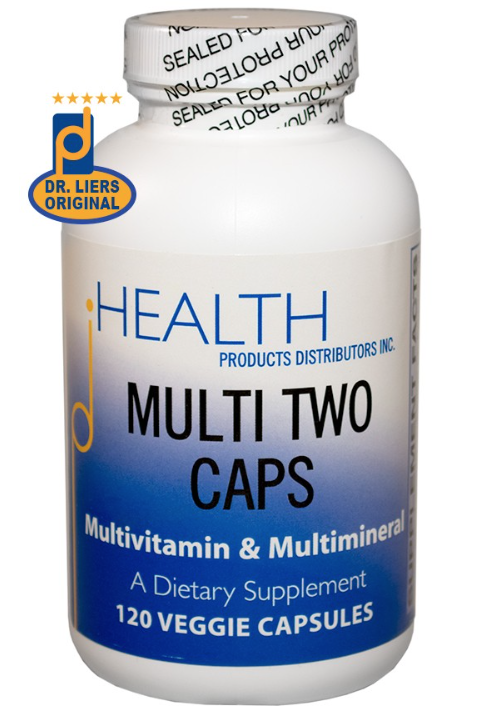 Multi Two Caps are among HPDI’s premier therapeutic-grade multivitamin formulas providing a complete range of nutrients. COMPLETE, BALANCED FOUNDATIONAL NUTRITION. Full-Spectrum of Nutrients Exceptionally Balanced for Supporting Your Health. Foundational Formula Ideal for Providing Essential Foundational Nutrition. A high-quality multivitamin is the foundation (i.e., core) for a complete nutritional supplement program. RAPID AND EFFECTIVE ASSIMILATION. Incorporates Bioavailable Vitamin and Mineral Carriers Your Body Recognizes and Can Assimilate Immediately. Plus, Multiple Carriers Ensure Assimilation. Tablet or Capsule Forms Rapidly Assimilated. POWERFULLY ENERGIZING. Includes Coenzyme Form Vitamins and Krebs Cycle Bionutrients that work with your body to create high energy levels. Full-Spectrum Essential Nutrients Needed For Building, Supporting, and Maintaining Excellent Health. HIGH PURITY. One of the Purest Available Supplements. Carefully Designed To Exclude Common Allergens, and Exclude or Minimize Excipients, Additives, and Fillers. TABLET AND VEGETARIAN CAPSULE FORMS. We Offer Both Forms Giving You More Choice. Take Your Pick. FOUNDATIONAL SUPPLEMENT. Providing solid foundational nutrition, MULTI TWO functions most effectively when used in conjunction with other foundational formulas, especially Vitamin C formulas (including ULTIMATE PROTECTOR™ and PRO-C™), Essential Fatty Acid formulas (including Omega Plus and Essential Fats Plus E), and REJUVENATE!™ superfoods. These foundational supplements together form the foundation of a complete nutritional supplement program. From here, you can add additional supplements (enhancements and specific condition formulas) addressing your individual needs, i.e., by pinpointing where your body requires additional nutritional support. A full-spectrum of B-complex vitamins, most in coenzyme forms, as well as more conventional forms. Includes Vitamin B1 as thiamin HCl and thiamin diphosphate, Vitamin B2 as riboflavin and riboflavin 5’-phosphate, Vitamin B3 as niacinamide and niacin, and Vitamin B6 as pyridoxine HCl and pyridoxal 5’-phosphate, folate from calcium folinate and 5-MTHF, Vitamin B12 as methylcobalamin and hydroxocobalamin, and biotin. All of the most absorbable and usable forms of the fat-soluble vitamin group, including Vitamin A (as natural beta-carotene), Vitamin E (as d-alpha tocopherol succinate and mixed tocopherols), Vitamin D3 (as cholecalciferol), and two forms of Vitamin K (K1 as phylloquinone and K2 as menaquinone-7). Effective herbal preparations, including quercetin, grape extract, octacosanol. Mineral carriers such as ascorbates, Krebs cycle bionutrients, and amino acids providing the body with important metabolic substrates and vitamins, including citrate, succinate, alpha-ketoglutarate, fumarate, malate, glycinate, aspartate, sebacate, and Vitamin C.
Includes betaine HCl to support digestive processes. Choline and inositol which play a crucial role in all of the cell membranes of the body, in brain function, and in liver function. Exclusion of the prooxidant minerals of iron and iodine which can lead to excessive free-radical production and PABA that sometimes adversely affects brain function in some individuals. Four-per-day full dosage of capsule form allows for partial dosing for children, seniors, and pets. Tablet and capsule forms are vegetarian (except for pharmaceutical glaze on tablets). Exclusion of ingredients such as wheat, dairy, corn, soy, and egg having well-known antigenic properties and that may be associated with allergy or delayed hypersensitivity reactions. Contains no GMOs. A minimum of excipients, fillers, lubricants, etc. that exert deleterious effects in some individuals. Multi Two is a great multivitamin and in many ways similar to the Mighty Multi-Vite!. However, Multi Two provides more B vitamins and in the case of certain B vitamins, it provides twice as much as Mighty Multi-Vite!. For anyone who requires plenty of B vitamins and who doesn’t necessarily want to take a separate, standalone B vitamin formula, Multi Two is an ideal multivitamin. For more information, see the full Multi Two product page (capsules) or the Multi Two product page for tablets. 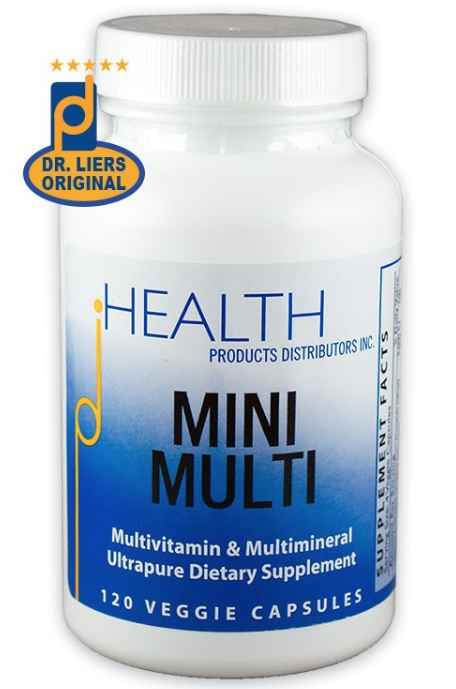 We call our Mini Multi the “World’s Purest Multivitamin.” This is because it was originally formulated for chemically and/or environmentally sensitive persons. The capsule is smaller than our other multivitamins which easily allows for partial dosing. It also is our only all coenzyme form multivitamin. MINI MULTI is an ultrapure, biochemically formulated, complete multivitamin supplement that includes essential and trace minerals, and cofactors. MINI MULTI is highly bioavailable and contained in a preservative-free veggie capsule (helping eliminate chemical contaminants). The capsule contains no fillers, flow agents, or any other excipients. Each component is the highest purity. MINI MULTI is ideal for chemically and environmentally sensitive individuals who require ultra-high purity supplements. The formula is designed by Dr. Hank Liers, who developed it as a ultra-pure formula for sensitive individuals. Yet, anyone can take MINI MULTI to benefit from its ultra-high purity and avoidance of additives, fillers, or other excipients. Many individuals who take MINI MULTI are not chemically sensitive, but suffer from allergies, sensitive digestive tracts, wish to avoid gelatin capsules, or simply do not enjoy swallowing large capsules (or tablets). Meet Mini Multi, the world’s purest multivitamin formulated originally for chemically and environmentally sensitive persons. MINI MULTI’s biochemical formulation incorporates the latest research on nutrient transport and interaction to enhance efficient metabolism and includes coenzyme forms of vitamins. The vitamins and minerals in MINI MULTI activate the body’s metabolic machinery, and synergistic cofactors aid absorption, assimilation, utilization, and metabolism of nutrients. MINI MULTI is among the first multivitamins to provide almost all coenzyme form B vitamins (i.e., all except vitamin B3, which we include as niacinamide). Coenzyme form vitamins are the natural forms best recognized and utilized in the body. For example, MINI MULTI provides folate in the form of folinic acid (a natural form of folate) from calcium folinate and L-5-MTHF (another natural form of folate), rather than the typical and commonly used folic acid, a synthetic form requiring enzymatic processing in the body for utilization. That is, coenzyme vitamins are easier to assimilate (especially for older individuals or those with health conditions that reduce enzyme activity in vivo) and they are immediately recognized and used in the body. No additives, fillers, flow agents, or any other excipients! MINI MULTI exhibits superior design, technical sophistication, ease of use, and high perfomance. We suggest you try it whether you are sensitive to fillers or flow agents, suffer from allergies due to common additives, wish to avoid artificial ingredients, or simply want the purest multivitamin available. In this day and age when many individuals suffer from allergies to ingredient sensitivities, Mini Multi represents a choice for the ultimate in high-purity. No excipients means a cleaner supplement option for anyone who may need it. HPDI’s KIDS MIGHTY-MULTI! is truly one-of-a-kind. It is most similar to the Mighty Multi-Vite! in terms of the nutrients it provides, including antioxidants. However, it is our only chewable and it tastes great. KIDS MIGHTY-MULTI! 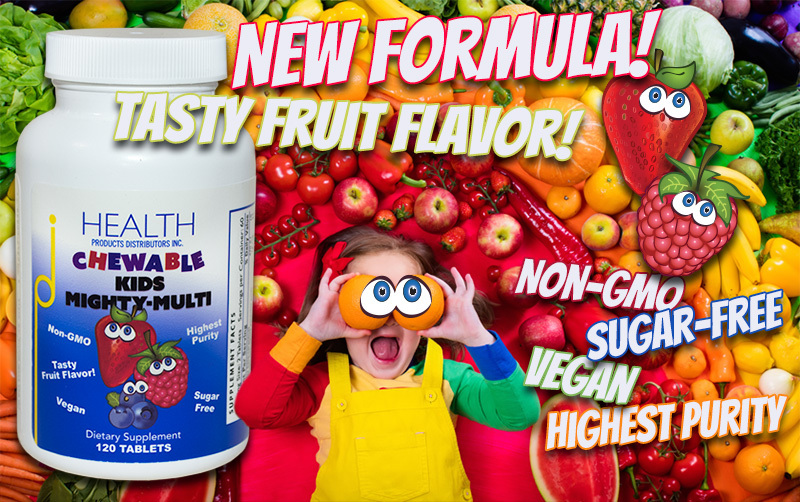 is an advanced chewable multivitamin for children incorporating the latest nutritional research in a tasty, complete formula combining the highest-quality and most usable forms of vitamins, minerals, herbs, and cofactors. Our children’s multivitamin formula provides optimal levels of basic essential nutrients and thereby is an ideal foundation upon which to build a complete nutritional supplement program. A high-quality multivitamin is the starting-point for building a program uniquely designed to suit to your child’s individual requirements. We offer KIDS MIGHTY-MULTI! as a “top-of-the-line” children’s formula that tastes great and produces exceptional results. This unique formula very effectively provides children with a solid foundation of nutrients for establishing, building, supporting, and maintaining excellent health during this critical period of their lives. COMPLETE FORMULA – the most complete children’s formulas available! It provides a full-spectrum of essential nutrients needed for creating, supporting, and maintaining excellent health for your child. It includes natural coenzyme form vitamins and Krebs cycle bionutrients that work with young bodies to provide energy for metabolic processes, healing, and optimal heatlh. AMAZING TASTE, NATURALLY – the most delicious kids multivitamin you’ll ever taste! Flavored with only healthy, natural sweeteners and functional taste enhancers, including mannitol, xylitol, fructooligosaccharides (FOS) (from chicory root), natural fruit flavor, and stevia leaf extract. Most of these taste enhancers actually exhibit other positive benefits in the body (i.e., prebiotic effects, cavity prevention, and antioxidant action). Kids (and adults) love the taste! BALANCED ESSENTIAL NUTRIENTS – exceptionally balanced nutrients for supporting your child’s health. This is a foundational formula ideal for providing basic nutrients for health. Indeed, a high-quality multivitamin is a basic foundational formula (along with vitamin C and essential fatty acid formulas) in a nutritional supplement program. Our kids’ formula puts your child on the nutritional track he or she deserves right from the start! “ULTRA PURE” – excludes common food source allergens (like wheat, corn, soy, or dairy). Also excludes unnecessary excipients, fillers, binders, and additives. Unlike many children’s vitamins, ours contains NO artificial colorings or flavorings, artificial sweeteners (like aspartame, saccharin, or sucralose) or hydrogenated vegetable oils…substances that can have deleterious effects on health (yet are frequently include. Plus, NO sugar and NO GMOs! RAPID ASSIMILATION – incorporates bioavailable vitamin and mineral carriers the body recognizes and can assimilate immediately. Plus, multiple carriers ensure assimilation. Chewable form speeds uptake in the body. 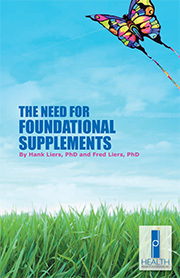 FOUNDATIONAL FORMULA – forms the foundation of a complete supplement program for your child. Formulated to work with other foundational formulas, including Vitamin C formulas (like PRO-C™) and essential fatty acid formulas (like Essential Fats plus E) that together form the basis of a complete nutritional supplement program. You can also add specific supplements addressing your individual needs of your child, i.e., by pinpointing where he or she may require additional nutritional support. Such specific supplements might include Allergy Support Plus, Joint Health Formula, or Ultimate Protector™ (super antioxidant & Nrf2 activator formula). 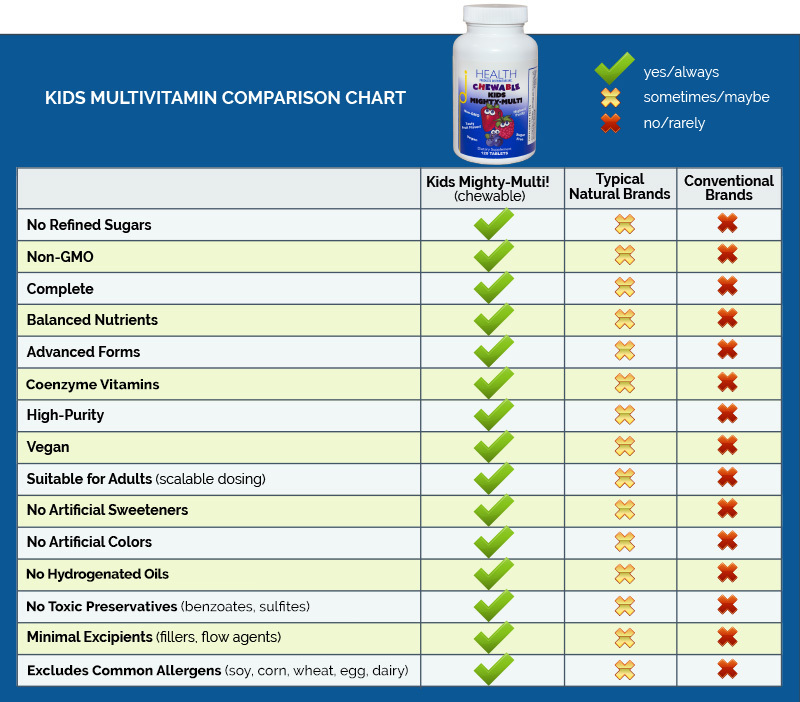 Kids Mighty-Multi is the perfect multivitamin for kids offering appropriate levels of a wide range of important vitamins, minerals, cofactors, and antioxidants. • A full-spectrum of B-complex vitamins primarily in coenzyme forms, including Vitamin B1 (as thiamin diphosphate), Vitamin B2 (as riboflavin-5’-phosphate), Vitamin B3 (as niacinamide and niacin), Pantothenic acid), Vitamin B6 (as pyridoxal 5’-phosphate), folate (as 5-MTHF), Vitamin B12 (as methylcobalamin), and Biotin. • All of the most absorbable and usable forms of the fat-soluble vitamin group, including Vitamin A (as natural beta-carotene), Vitamin E (as d-alpha tocopherol succinate and mixed tocopherols), Vitamin D3 (as cholecalciferol), and Vitamin K (as phylloquinone (K1) and MK-7 (K2)). • A complete and balanced supply of the most abundant carotenoids found in the body, including Beta-Carotene, Lycopene, and Lutein. • A variety of the best-known herbal ingredients, including Quercetin, Grape Extract, Turmeric extract, Broccoli Sprouts Powder, and Octacosanol (from policosanol). • Readily absorbed forms of all essential minerals, including Calcium, Magnesium, Potassium, Zinc, Iron, Manganese, Boron, Copper, Chromium, Molybdenum, Vanadium, and Selenium. • Easily assimilated mineral carriers, including ascorbates (Vitamin C), Krebs cycle bionutrients (citrate, succinate, alpha-ketoglutarate, fumarate, malate), and amino acids (e.g., glycine, taurine, and aspartic acid) that provide the body with important metabolic substrates and vitamins. • Sulfur-containing amino acids supporting the body’s detoxification systems. • Natural taste-enhancing complex of xylitol, mannitol, FOS, and stevia leaf extract. Tasty fruit flavor kids love! • Therapeutic levels of xylitol helping to prevent cavities. • Significant levels of choline and inositol that play a crucial role in all cell membranes, and in brain and liver function. • Betaine HCl to support digestive processes. • Exclusion of the pro-oxidant mineral iodine that may lead to excessive free radical production and PABA that can adversely affect brain function. We actually prefer the safer and more therapeutic Nascent Iodine over the forms normally found in vitamin formulas. • Exclusion of substances that have well-known antigenic properties and that may be associated with allergy or delayed hypersensitivity reactions, including wheat, corn, soy, egg, and dairy. • Minimum of excipients, fillers, or additives (that may have deleterious effects in some individuals). The vast majority of children’s vitamins today are decidedly not advanced formulations. They typically provide only minimum amounts (i.e., no more than government mandated daily values) of vitamins, minerals, and other nutrients. In addition, most kids’ vitamin on the market remain filled with sugars and artificial ingredients, including aspartame (a known toxin), artificial colorings, preservatives, hydrogenated oils, and other toxic substances. Aspartame. There is controversy surrounding this artificial sweetener, which is associated with a variety of neurological problems. In fact, there is widespread consensus that children under six should not use aspartame. We believe no one should consume aspartame at any age! Refined sugars (usually listed as, sucrose, etc.). There is no place for sugar in multivitamins. Sugar in supplements is also dangerous because when coupled with ascorbic acid, it can damage teeth! Chewable kids vitamins containing sugar expose your child’s teeth to double jeopardy. Artificial dyes (FD&C Yellow, Blue, and/or Red). Artificial colors are associated with a wide range of health and behavioral problems. These include carcinogenicity, and contributing to learning problems like ADHD. In addition, FD&C Yellow dye #5 (tartrazine) is one of the main food triggers of asthma attacks. Benzoates, sulfur dioxide, sulfites. These are bad because they are all preservatives that have no business being in a health supplement. They all are known to stimulate allergic reactions. Hydrogenated oils. These are the bad, sticky fats that are found in junk foods and are harmful to your child’s heart. Incredibly, some companies put hydrogenated oils in a children’s vitamin! 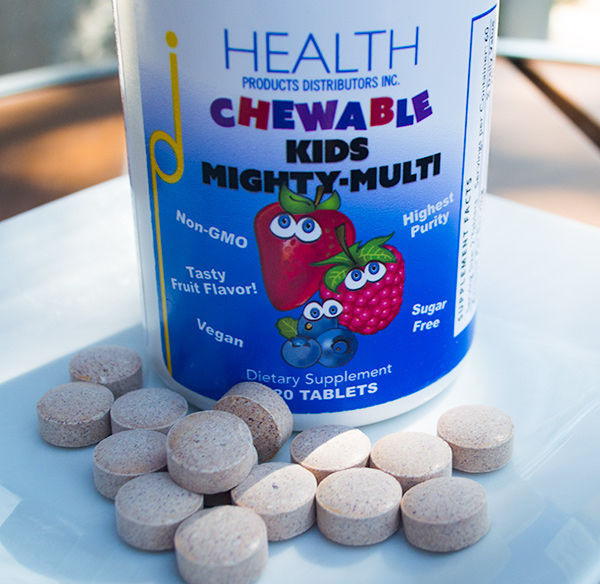 As you can see, our children’s chewable multivitamin is not your ordinary kids multivitamin, and it provides all the benefits of our other multivitamins in a tasty chewable format. In fact, many adults take it who prefer a chewable over a capsule or tablet. It is uniquely formulated to be scalable for adults at the dosage of two tablets per 20 lbs body weight. 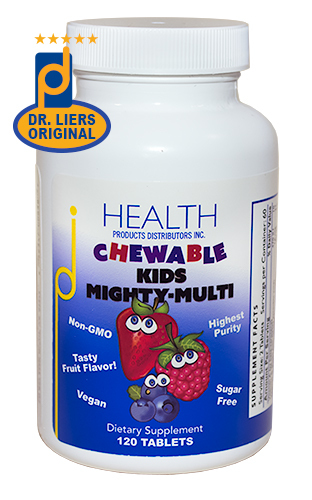 Chewable Kids Mighty-Multi tastes great, provides advanced forms of nutrients, and scales up for adults. Multivitamins are the first supplement most people need and should take. Taking a high-potency, high-purity multivitamin daily provides many benefits beyond what you might expect. This includes everything from ensuring against deficiencies to providing amounts necessary for optimal health, and for compensating for greater needs depending on your unique biochemical individuality. Given the overarching safety and relatively low cost of multivitamins, they are best “first defense” in a nutrient-depleted world. HPDI offers four of the best multivitamins available anywhere, and five if you consider that Multi Two is available in capsules or tablets. So take your pick among them, and be the healthiest you can be.